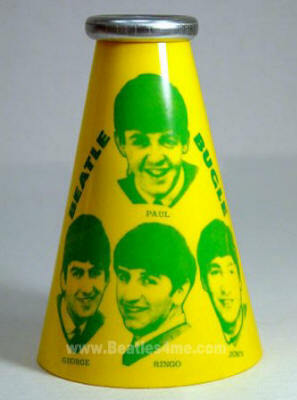 Beatles Megaphone (Yellow), 1965, ONLY sold at USA Beatles Concerts!!! 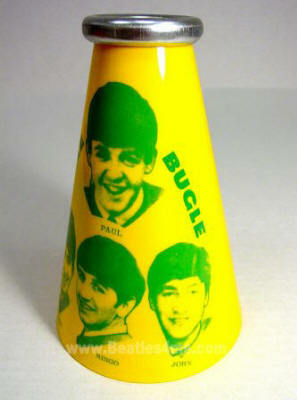 One of the most unusual Beatles memorabilia items to emerge out of the 1960's is The Beatles 1965 Concert Megaphone (or Bugle), Mfd. by Yell-O-Phone. Authentic Original Megaphones are identified by the embossed Yell-O-Phone logo located inside the bugle. Real megaphones in Near Mint- condition are rare to find, as most of them are either completely cracked, fractured, missing the neck-chain or missing the metal mouth piece! 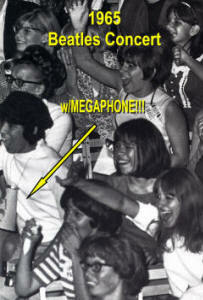 For the longest time, ONLY A DOZEN or so Megaphones were known to even exist! The Megaphones were sold "only" at The Beatles 1965 Concerts held at baseball stadiums and other large venues here in the USA (see enclosed photo). According to one first-generation Fab 4 Fan, ...after the concert, it was amazing to see so many of these Megaphones in pieces on the ground after being crushed by the crowd. While wearing the Megaphone around one's neck at the Beatles Concerts, all it took was a gentle push against the Megaphone itself and a fellow Beatles Fan standing in front in order to crack it! For this reason alone, they are Extremely Rare Collectibles! Only three variations of ORIGINAL & AUTHENTIC Beatles Megaphones have been confirmed to exist: Bright Yellow w/Green print, White w/Bright Red print and Bright Orange w/Black print. They were manufactured with a chrome metal mouth piece and metal neck-chain. Featured on the front are large photos of each Beatle with the words Beatles Bugle printed across the top. They are a statuesque 7.5 tall with a 2 diameter mouth and a wide 5 diameter base. 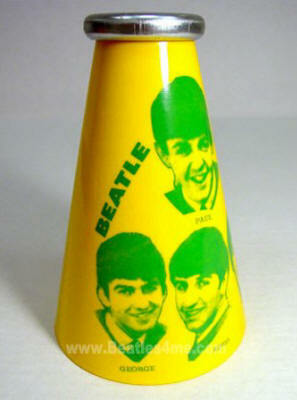 The Megaphone being offered here is a "Bright YELLOW w/Green Print" version in Near Mint- condition (see photo below). All Megaphones offered here are Guaranteed Authentic and come with a "Letter Of Authenticity". 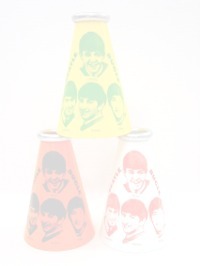 The Megaphones are Excellent 3-Dimensional Showcase display pieces for any Beatles collection! Unbelievably RARE! Don't Miss This ONCE IN A LIFETIME Opportunity! Beatles Megaphones/Bugles that are "smaller in size" manufactured with a "hard plastic rimmed mouth-piece" and "different photos" than described and shown here are blatant COUNTERFEIT REPRODUCTIONS!!! These "inferior plastic cones" don't look anything like the real deal! In addition, the counterfeit reproductions DO NOT have the Yell-O-Phone company address information stamped on the inside of the Megaphone, as shown in the photo below. Only Authentic Beatles Megaphones/Bugles will have the company name and address physically stamped inside the larger opening.